Here they are—THE Revolutionary Strings!!! Here is the string that will give your music a sound like no other. It is more revolutionary than even the Blue Steel strings were when they were introduced. As a matter of fact, the Helix HD is the most innovative break-through in string technology since the beginning of stringed instruments! To make the Helix HD, the patent-pending, Hyper-Elliptical Winding process took over a year of many trials to find just the precise elliptical shape for the winding wire. This shape then had to be paired with the correct winding process that would produce these stupendous results—the maximum mass for the string’s diameter that still maintained the string’s vibrancy. More mass makes a fuller tone; more windings give a smoother feel as well as a brighter, more resonant tone. This provides a smoothness and performance unrivaled by any conventional string. 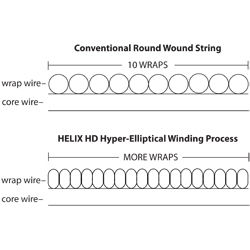 The Hyper-Elliptical Winding process results in an increased number of wraps along the length of the string. This increases the mass of your string, without changing its diameter or material. The graphic to the right demonstrates how there is more mass and a smoother feel. Imagine your usual string's feel as you press and strum the normal wrap wire (illustrated in the diagram at the top). Your fingers experience resistance as they go down into each depression between the wraps. Now imagine the smoothness while playing the less coarse wrappings (illustrated in the diagram at the bottom).Your fingers glide more easily and smoothly along the surface of the wrap wire. 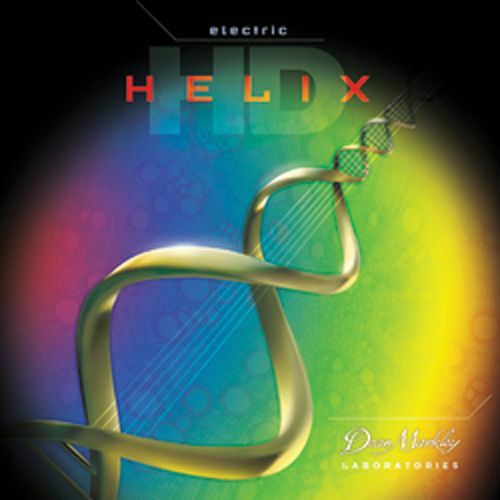 Helix HD — Enjoy experiencing the most innovative guitar string made… Ever! Oh, and one other thing… As a pleasant side effect of this revolutionary technology, the strings last much longer—they give your wallet more mass too.